Cardlytics, a US-based company, has a strong value proposition and its transaction-driven marketing solution integrated to the bank’s online banking service has a proven impact on usage and revenue generation. In a nutshell, they display relevant merchant coupons within online banking. Earlier this week, I covered Finovate Europe 2012 live on the Visible Banking blog. At the end of another long day packed with innovative digital services and platforms, I managed to record a short interview with one of the top demoing companies awarded with ‘best of show’, Cardlytics. Basically Cardlytics‘ permission-based marketing solution integrates into the online banking service of the bank. The bank customers don’t have to do anything, but carry on shopping in-store or online as usual. Then, they benefit automatically from targeted, relevant, rewards credited through their bank reward program. The whole process is seemless and totally electronic, there is no exchange of coupons. In my opinion, the strongest benefit of the Cardytics solution is that it is totally seemless for the customer. And I see the potentially massive value of displaying relevant offers when and where it makes most sense, hereby directly under the right payment transaction within your online bank statement. It is simple, and it looks sleek. Brilliant. If the solution is hosted by the bank on premises, I believe the advertising offers are currently served by the company servers based in the US. 1. How soon does Cardlytics plan to serve the electronic offers from a European base? Clearing this with the IT security and L&C departments could very well be the biggest challenge for European banks. Safe harbour is ok, but the patriot act is always a concern. But I believe in that case, the challenge is worth it. 2. How strong is their advertisers network outside the US? I invite you to watch my interview with Lynne Laube – President & COO at Cardlytics about their solution integrating ‘merchant coupons directly into online banking. If you enjoyed watching this video, please like it on youtube. 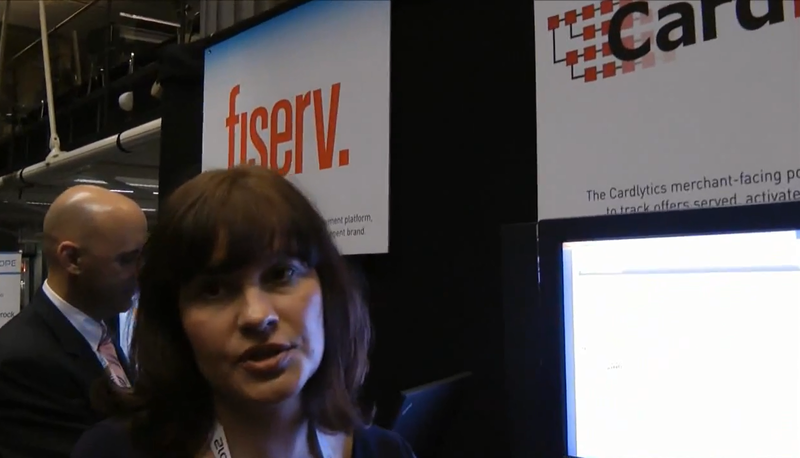 This is one of the 12 interviews I recorded during Finovate Europe 2012 (London, 7 Feb 2012). I invite you to check my comprehensive coverage directly on Visible Banking. Among other insights, my article lists the other eleven interviews, and includes a crowdsourced write up on the 35 demoing companies as well as my 220+ pictures from the event. Take the extra few seconds to type in the bank’s website URL or have the site bookmarked on your browser for quick access.